These boards connect directly to your JAMMA arcade harness. The units boot directly into a game selection menu and operate just like a normal arcade PCB. You can even setup difficulty levels and credit values. A button on the PCB allows you to exit whichever game you're playing into the menu screen. A connector on the JAMMA edge card connector allows you to add a button to the control panel to make it easier to abort to menu. The 3-39/1 boards play vertical games and the 100-400 GameBoxes play horizontal games. 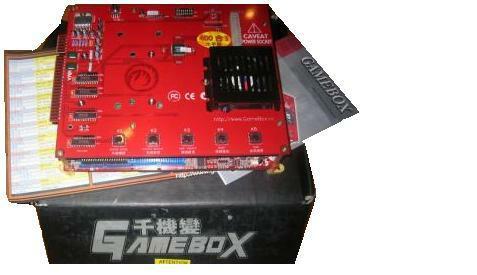 Included is a new, sealed GameBox JAMMA PCB. The 100-400/1 boards include their own PC-style power supplies which operate at 110v or 230v, and include plastic mounts for fixing the PCB to the inside of your cabinet. The video output is 15kHz standard resolution raster (standard resolution arcade monitor) via JPac. Also included is a game wall chart, GameBox sticker for your cabinet and operating instructions. It is really easy to install and use. Just plug it in, connect the power and start playing!